The Loyola University New Orleans College of Law Moot Court Team won first place at the University of Tennessee Regional Moot Court Competition last weekend, earning the team a spot in the nationals this February in New York City. 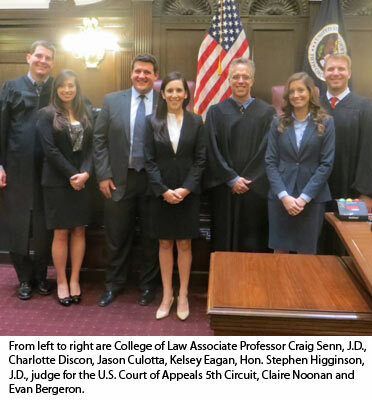 Law students on the team included oralists Kelsey Eagan and Jason Culotta, brief writer Charlotte Discon and coach Claire Noonan. College of Law professor Monica Hof Wallace, J.D. ’98, served as the faculty adviser. The team prevailed against Belmont University, Faulker University and the University of Alabama School of Law, before beating the University of Memphis Cecil C. Humphreys School of Law in the final round. Eagan won an award for best oralist and the team’s brief, written by Discon, placed fifth. The Criminal Procedure Team also competed last weekend at the University of San Diego Appellate Moot Court Competition. The team included oralist Kristyn Lee, oralist/brief writer Sean Brazil and coach Chris Whelen. The team advanced to the quarter finals and placed in the top eight. Lee won an award for best oralist and the team’s brief, written by Brazil, won fourth place.